With the UK potentially leaving the EU this year, either with a deal or without, there is much uncertainty around what this means for travel. With so much unknown around the topic, planning a future holiday can cause many questions to arise about what could happen in the near future. SixStarCruises.co.uk is protected by both ABTA and ATOL, meaning that when you book with us you will be fully protected no matter what the outcome is for Brexit. Read our FAQs on the subject and see what the cruise lines have to say for themselves regarding Brexit below for some helpful answers. Click the questions to expand and read the answers. Will I need to worry about currency during my cruise? A cruise is one of the best ways to travel when considering currency as it’s the least affected by fluctuations. Most of the time you can pre-pay for your drinks, gratuities and excursions to protect against any negative impacts of the exchange rate. Can I still book a cruise within the EU? Stuart Leven, VP EMEA and MD of RCL and Chairman of CLIA UK & Ireland has reported that the first cruises taking place in the post-Brexit area – beyond the three-year moratorium period after the referendum – are now on sale and there are no signs of a drop in consumer confidence. In short, you can still book a cruise within the EU. Prior to the UK leaving the EU, nothing will change and following this event, there are specific passort implications to consider for any future travel, which are highlighted below. After the UK leaves the EU, and in the event of a no-deal Brexit, those planning to travel abroad will be required to have six months left on their passport. In light of this, the government is advising customers to visit the HM Passport Office online passport checker here: Check a passport for travel to Europe. Will I need to acquire any additional documents? The European Commission has said that even in the event of a no-deal Brexit, UK citizens will be able to visit the EU for up to 90 days within a 180-day period, without a visa. This is for short-stays and is also dependent on the UK continuing to offer reciprocal visa-free access to EU states. However, from 2021, British people will need to apply for an additional document to travel to member states. The European Travel Information and Authorisation System (ETIAS) will cost €7/£6.30 and be valid for three year – though it won’t come into effect until 2021. Until then, cruisers can continue as normal when visiting the EU. Will the European Health Insurance cards still be valid? The European Health Insurance Card (EHIC) allow any EU citizen to access medical care when travelling within another EU country. In the event of a no-deal Brexit, EHIC’s registered within the UK will no longer be valid. For travel insurance in general, those looking to travel are advised to check their policy details and contact their insurance provider if they are unsure as to whether they will be covered in all eventualities of Brexit. Currently, UK residents travelling within the EU aren’t charged for extra roaming and are able to use their phones as they would in the UK. However, in the event of a no deal this may change. The government has advised it would put measures in place for a cap on the cost of mobile data usage abroad at around £45 per month – it’s currently €50 under EU law. Can I still drive abroad? There may be some additional requirements for driving abroad in the event on a no-deal Brexit as your licence may not be valid as a standalone document. For those looking to hire and/or drive a car abroad, you may need to apply for an International Driving Permit (IDP) which costs £5.50. Another document which UK residents would need to acquire would be the Green Card, which ensures your car insurance will still be applicable in the EU. These are usually issued by insurers and may incur a small fee. It’s best to speak with your insurer for more information on obtaining a Green Card on future trips following Brexit. What is the process to visiting the EU after the UK leaves? Following a no-deal Brexit, there will be a soft-launch of the European Travel Information and Authorisation System (ETIAS) for the first six months. There is an option to extend this under the European Commission for a further six months if required. The ETIAS requires that ever prospective visitor to the EU registers their details online and pays a fee of €7/£6.30, though under-12s can be registered free. The information provided will then be compared against relevant databases and a decision is made on whether or not to grant ETIAS. Once you are granted ETIAS, these are valid for three years or until your passport runs out. Currently, it is not clear whether you may need to register your travel plans online before each visit or not. ETIAS only applies to third-country, visa-exempt travellers, which the UK will be following after it leaves. Can I still fly within the EU? Following a no-deal Brexit, UK and EU licensed airlines will lose their automatic right to operate air services between the UK and EU, without seeking advance permissions. This includes EU licensed airlines operating wholly within the UK (Heathrow to Edinburgh), and UK licensed airlines operating intra-EU services (Milan to Paris). After the UK leaves and under a no-deal Brexit, airlines looking to operate between the UK and EU would need to seek individual permissions from respective states. The government has advised the UK would envisage granting permission to EU airlines to continue to operate, and that it would not be in the interest of any EU country or the UK to restrict the choice of destinations which could be served. What do the cruise lines have to say about Brexit? Due to the changes Brexit could potentially incur, some cruise lines have spoken out about the possibilities of Brexit to the cruising community. 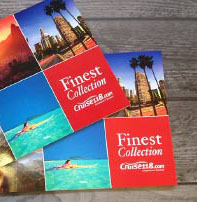 A cruise offers a perfect option for those needing a little extra reassurance with their future holidays. A cruise often has everything included, fixed prices and little to no unexpected bills. Cruising from the UK is ideal as there are no flights required and it removes any additional stresses that come with being at the airport. If you need to discuss your future cruise bookings or have any questions about the above, call our Cruise Concierge team on 0808 202 6105 for advice on cruising both within and outside the EU.